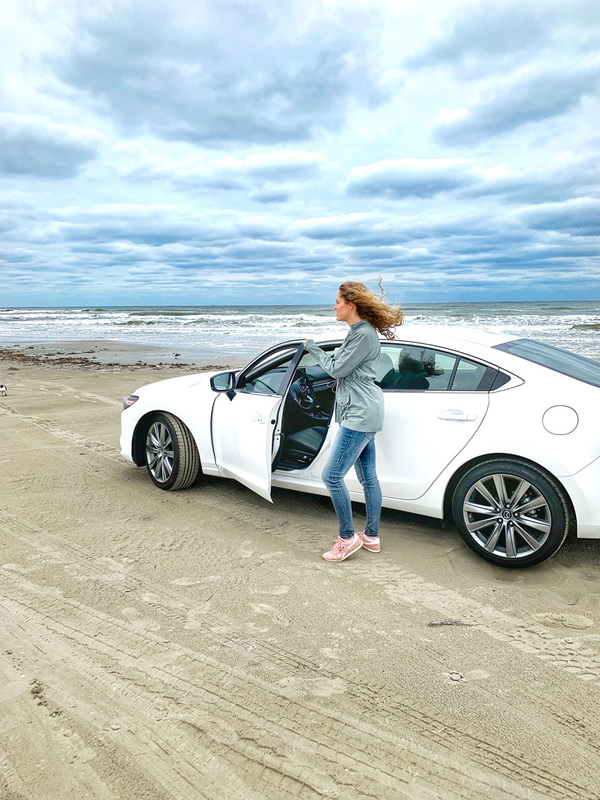 Disclosure: I was provided with complimentary passes from the Galveston Island Convention and Visitors Bureau and rental of a Mazda6 Signature in exchange for this post. All thoughts and opinions are my own. Every year my family and I plan a spring break getaway to help us get through the last few weeks of winter. 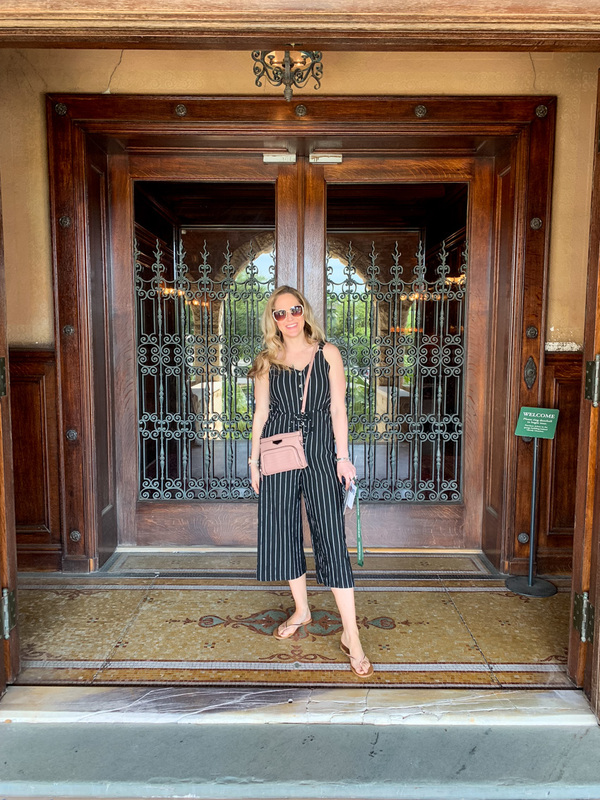 This year we spent a lot of time looking for new destinations to check out and knew that we really wanted to visit and stay near the Gulf Coast. Upon researching, one place that continued to pop up over and over again was Galveston Island, Texas. Galveston has a unique charm, many family-friendly attractions, drool-worthy food, and the picturesque white sand coastline takes your breath away. 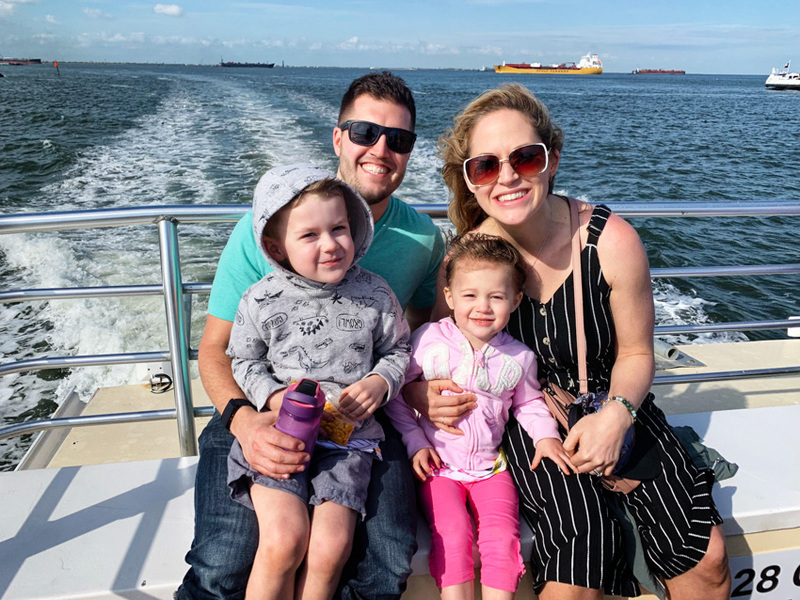 When you put all of that together, Galveston Island and the surrounding area makes for an amazingly fun and relaxing family vacation getaway! 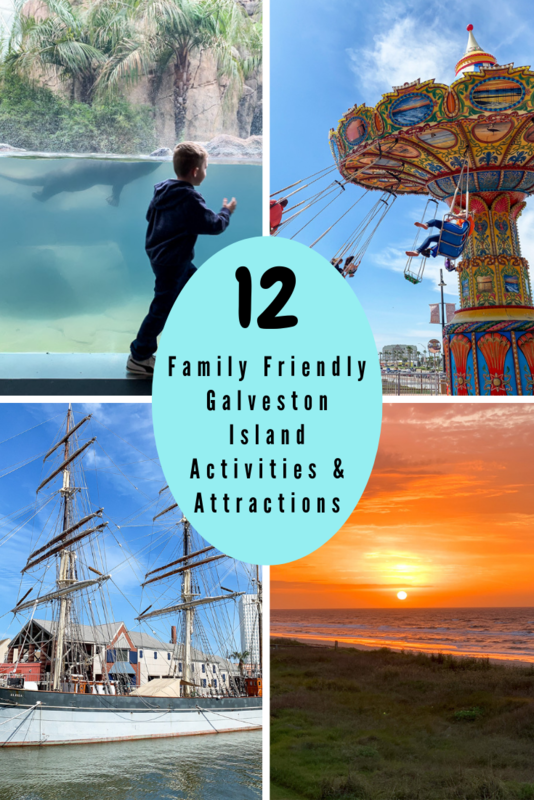 I’ve put together a list of some of our favorite family-friendly activities to check out when visiting Galveston Island. You could easily spend 3-4 days exploring and enjoying the island, so be sure to allow plenty of time! 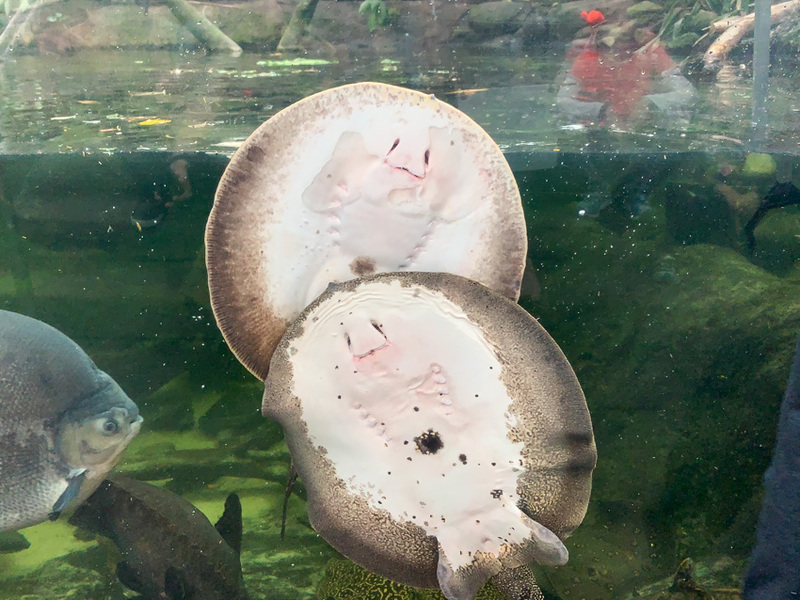 Moody Gardens has 3 different pyramids of attractions to choose from: Rainforest, Aquarium & Discovery. 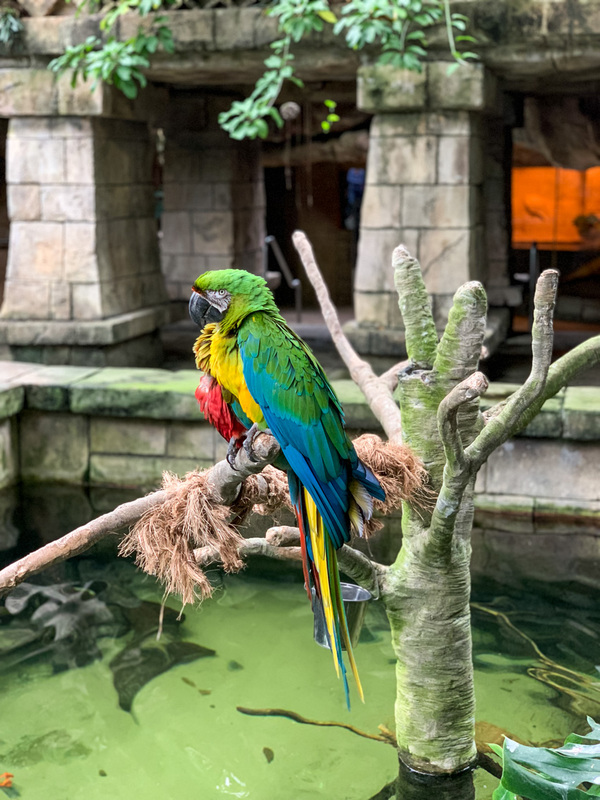 On our visit, we visited the Rainforest Pyramid to see the different flora and fauna of the rainforest. 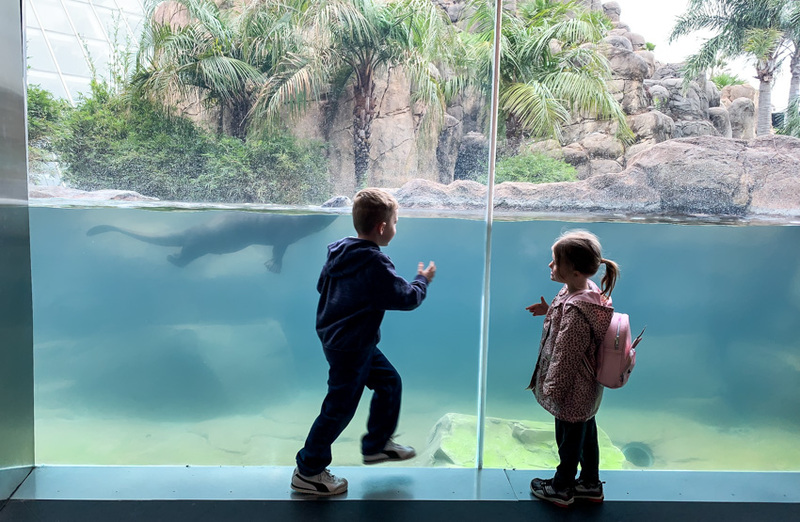 My children delighted in seeing all the animals (especially the otters as well as the birds and marine life in the terrarium). Make sure to take time while there to catch some of the talks and special exhibits. We were able to attend a marine life feeding and it was so fun watching all the fish and especially the stingrays. The Aquarium Pyramid allows you to experience life as you explore the oceans’ depths in a 1.5 million gallon aquarium. 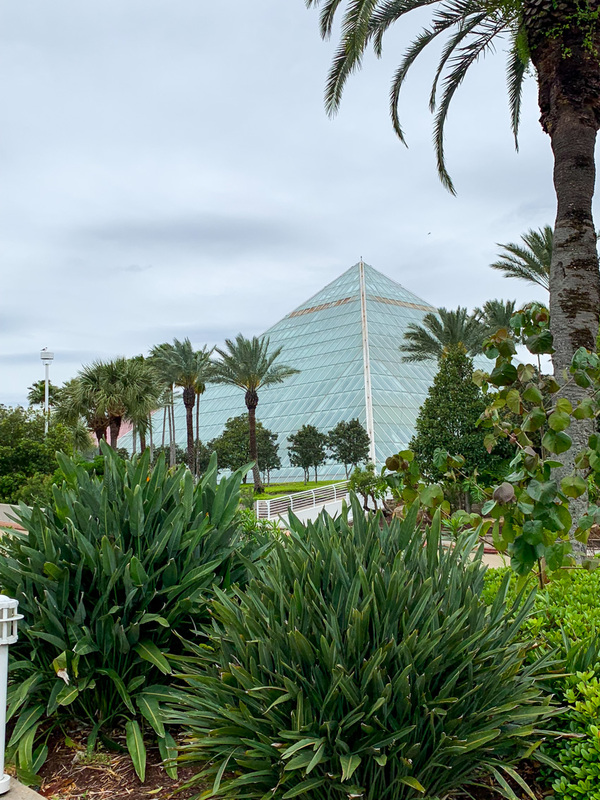 The Discovery Pyramid has a museum exhibit as well as a Teenage Mutant Ninja Turtle Exhibit. 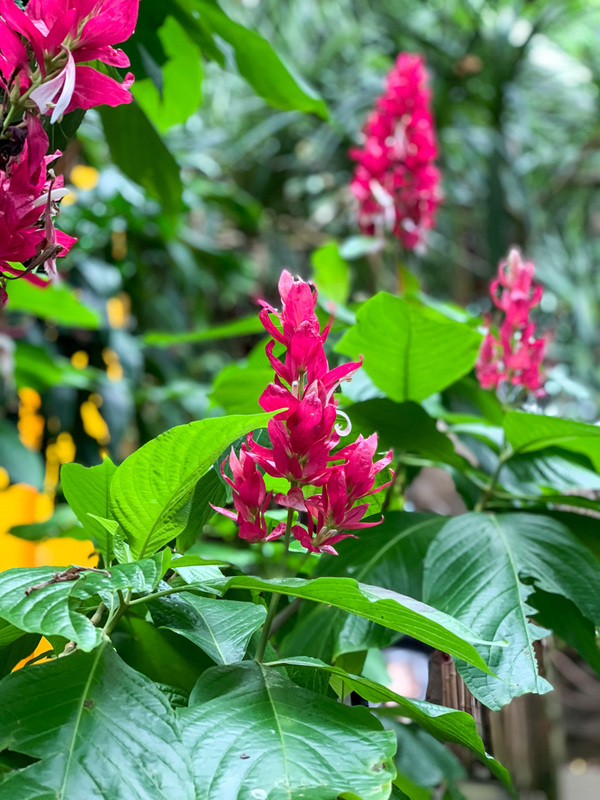 There are also so many other fun activities to do on the Moody Garden grounds, such as a ropes course and zip lines, Palm Beach lazy river, paddlewheel boat rides, theaters and more. You can purchase one or multi-day passes, as well as buy tickets to individual attractions. Allow several hours for each attraction. Galveston Island Seawall offers over 10 miles of beautiful beaches for sunbathing, picnicking, swimming, playing and enjoying the views. 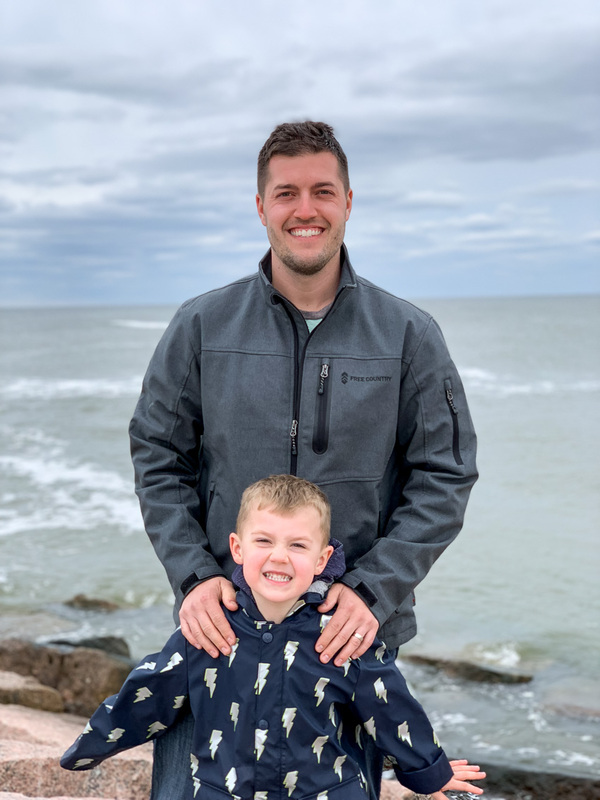 There are a ton of stores, restaurants and bars that line the way that offer amazing views (we loved our time at BLVD Seafood). You can park along the road (you do need to pay for parking) for a quick walk to the beach. 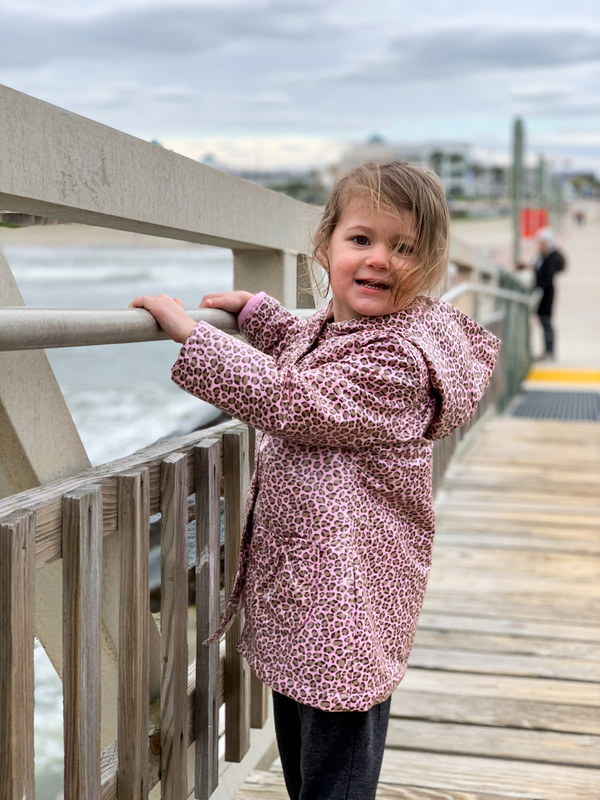 It was a bit chillier of a day when we arrived (late March), but we still had a blast walking the Seawall, exploring the beach and checking out the piers. One of the favorite activities that we did on our trip was the Harbor Tours at Texas Seaport Museum. Take the Seagull II, a 5o foot vessel, to explore and sight-see the harbor. We learned so much about the history, business, wildlife and ports around the area on our boat ride. We even had dolphins that made an up close and personal visit that everyone absolutely loved (check my Instagram stories to see them under my Galveston highlight reel). The boat ride lasts about an hour and be sure to pack a light jacket or sweatshirt to stay warm. 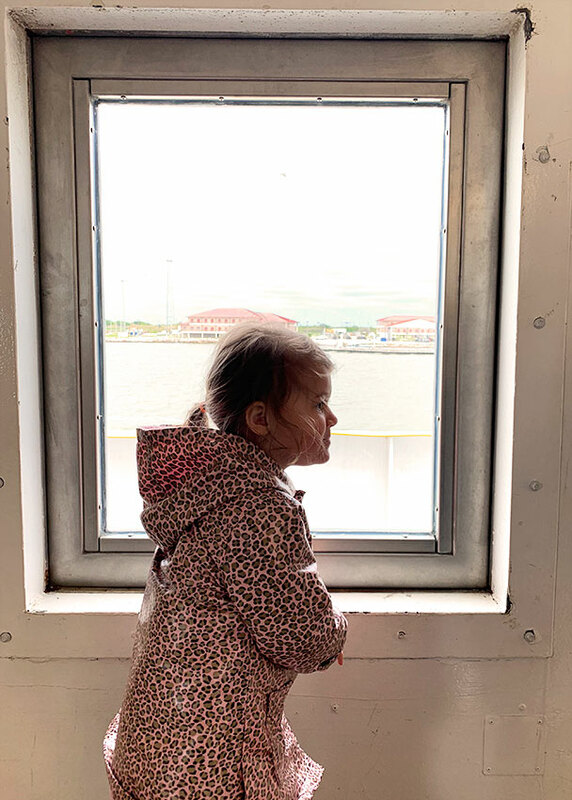 The Texas Seaport Museum is a great resource and learning center to learn about immigration in the area and a lesson in history. 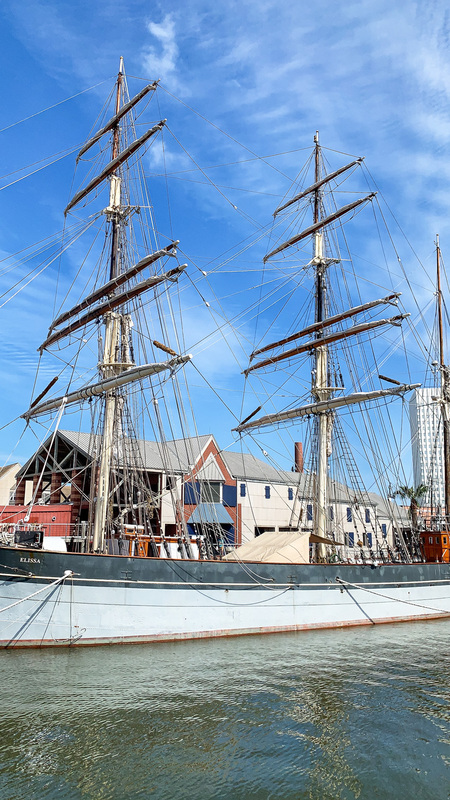 The Seaport Museum is also home to Elissa, an 1877 tall ship which you are able to board and explore above and below deck. 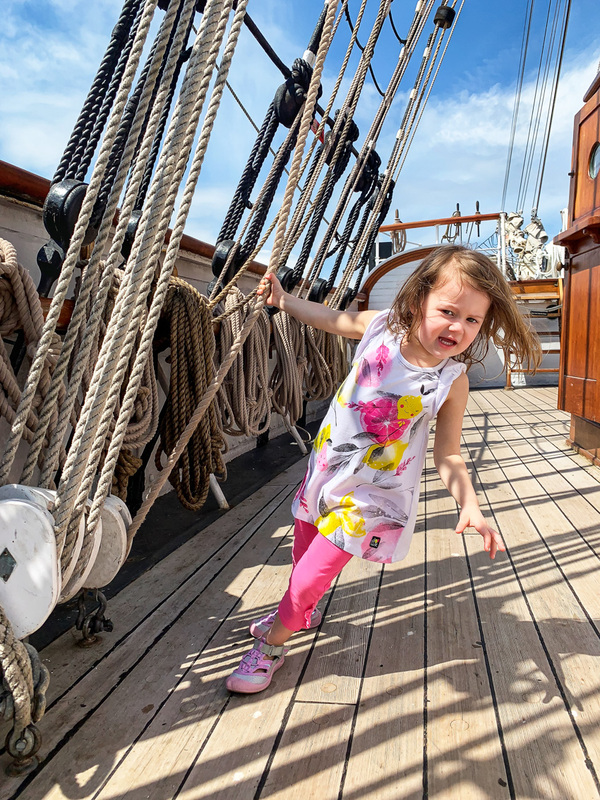 My kids could spend hours here exploring every nook and cranny of the ship and pretending to be pirates. To make it even cooler, the Elissa is a working ship that we actually saw out in the water sailing a few days after our visit. 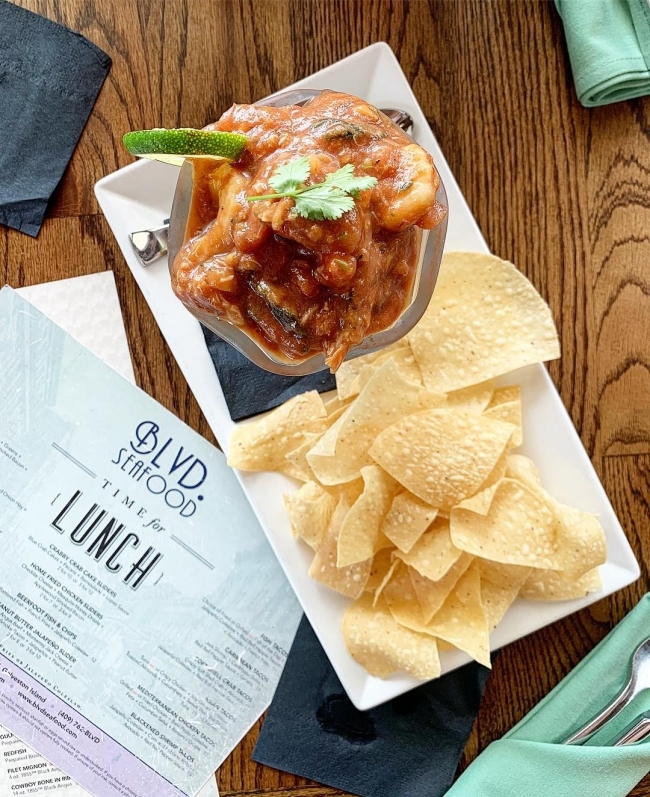 Galveston has so many different types of culturally rich cuisines and we took full advantage of tasting our fair share of fresh Gulf seafood! 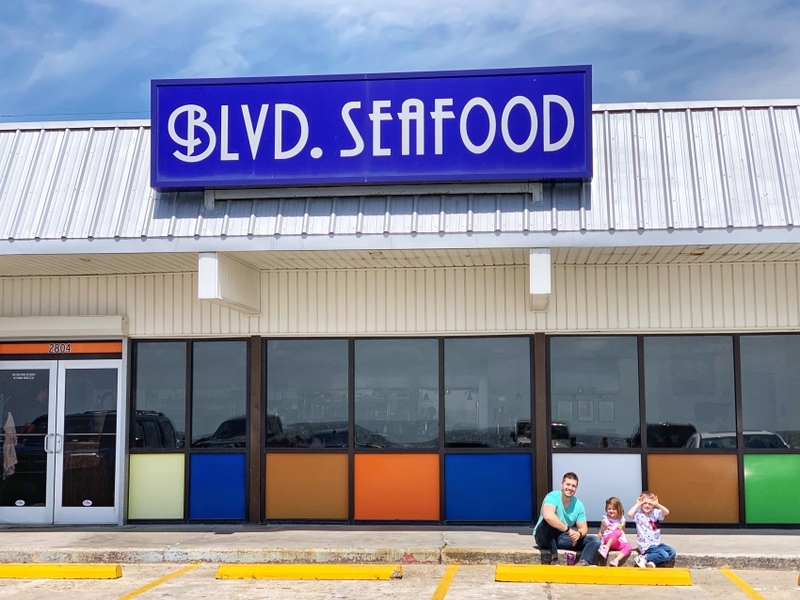 For a great lunch or dinner with a view of the gulf and Pleasure Pier, BLVD Seafood was great! With fresh seafood, great service and fantastic view, it’s perfect for families. 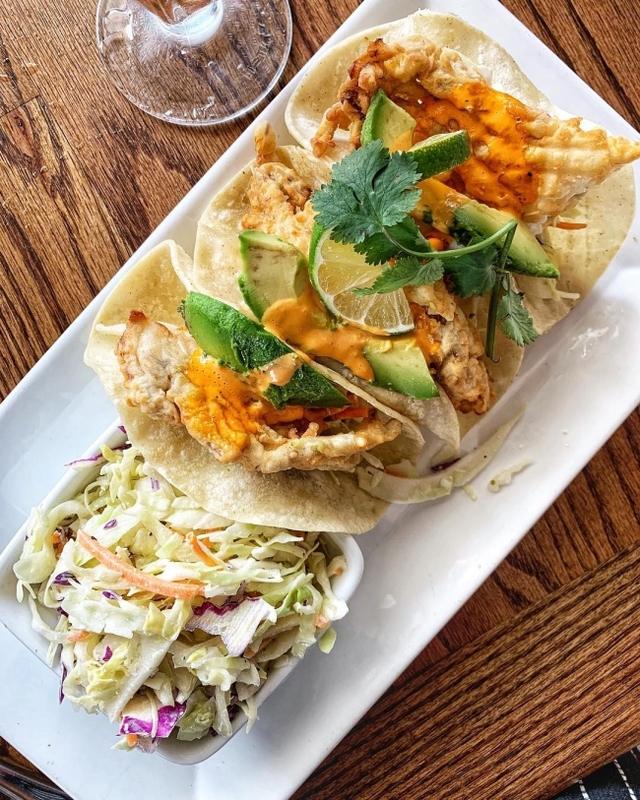 We started with the campechana, a mixture of shrimp, crab, avocado, tomato served with corn tortilla chips, that we all enjoyed (even my youngest), followed by delicious soft shell tacos and flavor-popping cedar salmon. Don’t skimp on dessert…the bread pudding is oh-so-good! 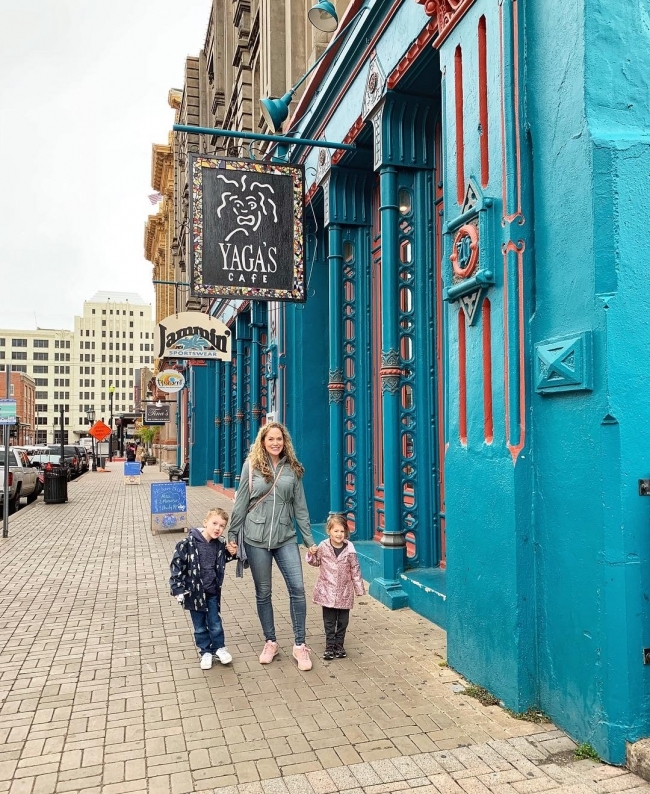 For brunch, Yaga’s (located on the Strand) is a great stop! 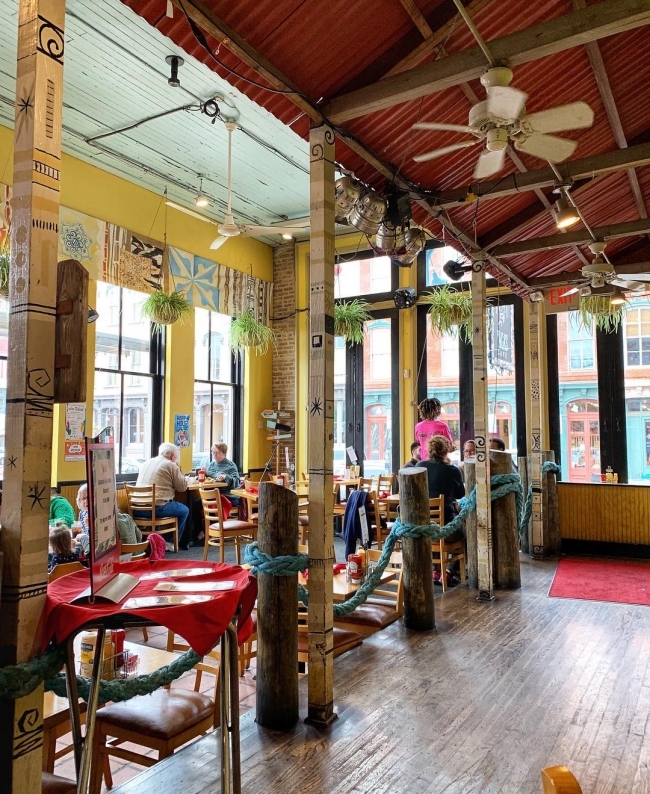 This cute, laid-back and bright cafe has a delicious brunch menu and super affordable drinks (mimosas – carafes are only $9!, bloody mary’s, micheladas). The brunch has everything from french toast, eggs, seafood frittatas, burgers, hash bowls and more. 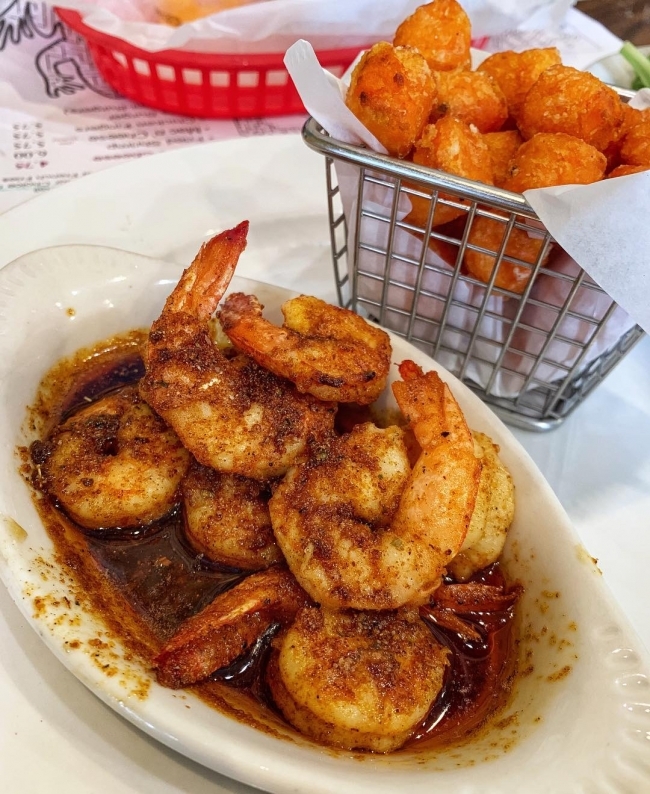 My spicy butta shrimp were oh-so-good! While we weren’t there in the evening, I heard great things about their live music and evening events too! 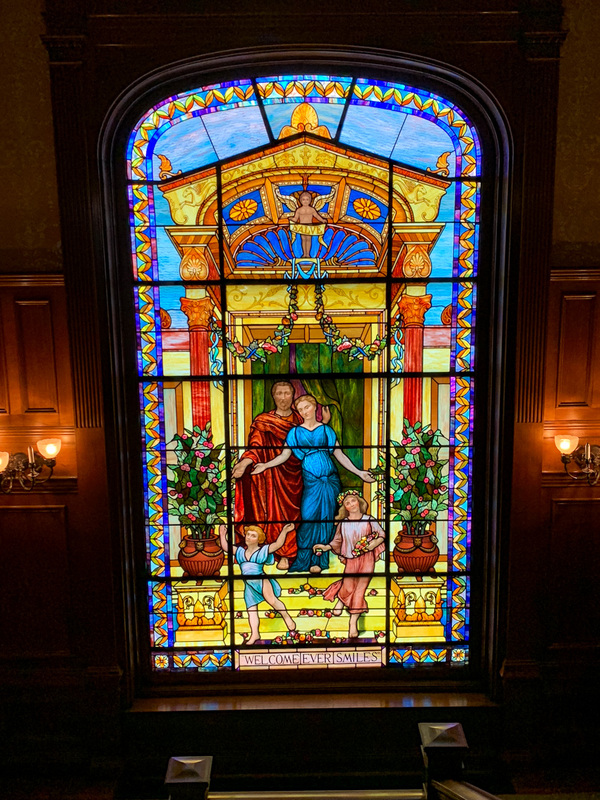 The Moody Mansion is breathtakingly beautiful and one of the most famous houses in the nation! 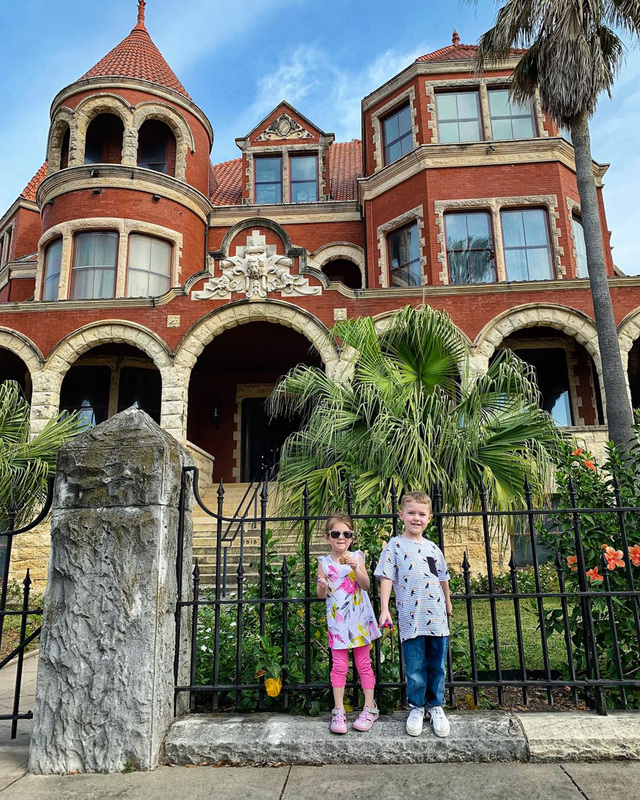 Take a step back into time when exploring the historic mansion and learning about the Moody family and their influence in the Galveston area. 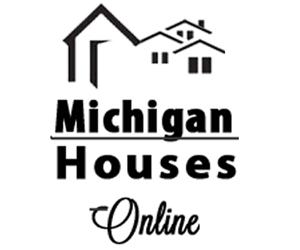 The large brick home is adorned with gorgeous woodwork, art work, and architecture. 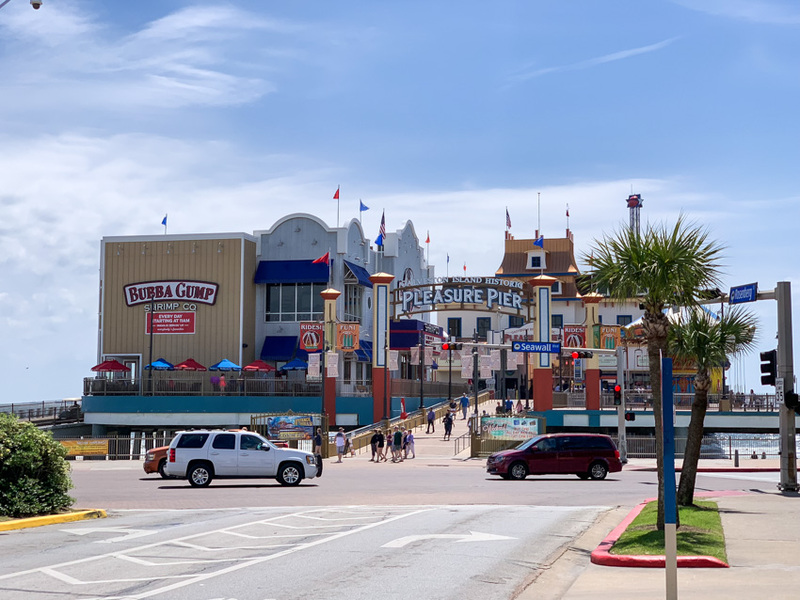 The Galveston Island Historic Pleasure Pier features family-oriented attractions including rides, games, a wide selection of food venues and retail shops all with a beautiful waterfront view. Music and delicious smells stream from the bright and fun pier. 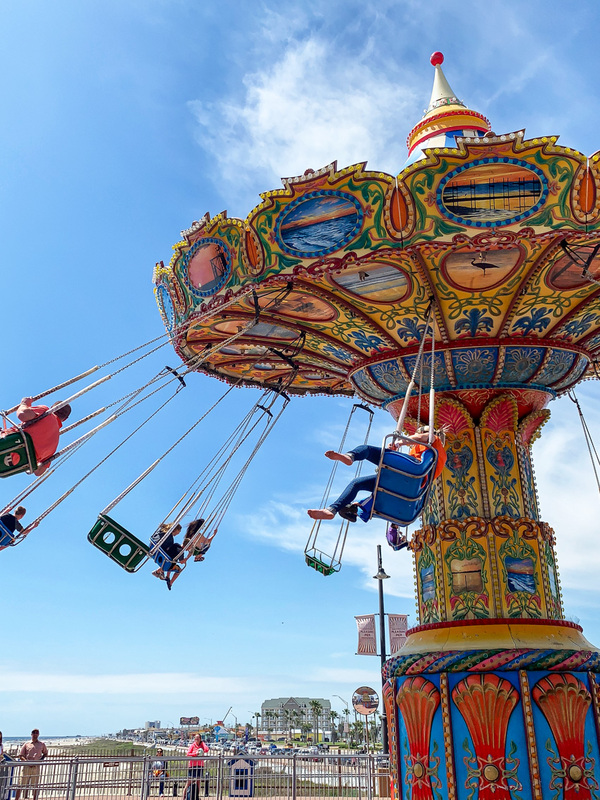 The pier can be a bit pricy, so your best option is to buy a wristband for unlimited rides. 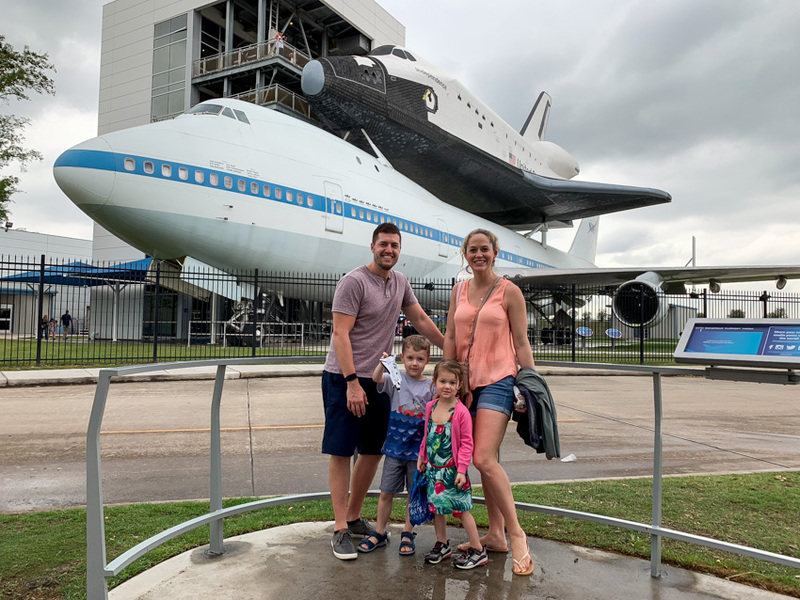 The Space Center Houston is a little over an hour drive from Galveston, but worth the drive! Delve into all things space and science and delve into an immersive and hands-on learning experience. With over 400 things to see and do, there is something for everyone in your family. 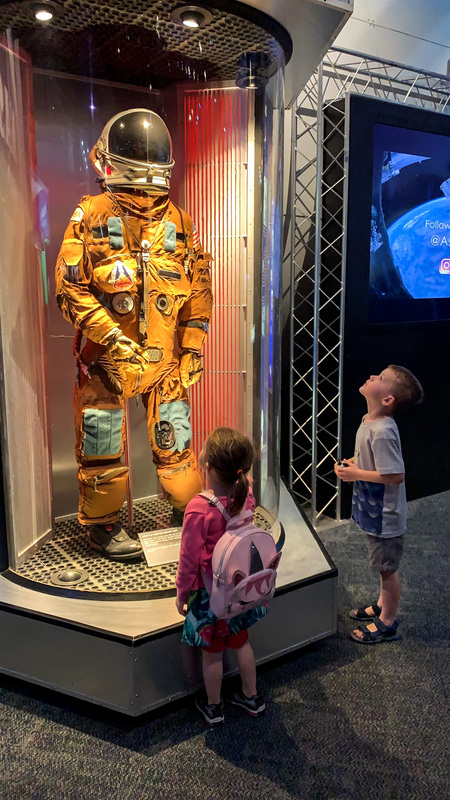 From spacesuits, to moon rocks, theaters, virtual reality, science experiments, presentations and chats with astronauts. You can even walk through the shuttle replica Independence, mounted on top of the historic and original NASA 905 shuttle carrier aircraft, and then explore the giant plane. Our kids were starstruck and couldn’t stop talking about it for days! Allow at least 4 to 5 hours to see it all (we were there nearly 4 hours and didn’t even see the whole center). There is a free ferry that travels back and forth from Galveston Island and Port Bolivar, a neighboring peninsula. The ferry takes about 20 minutes one way and is a great free way to see the surrounding area. If you’re lucky, you might even see dolphins following the boat. The wait times to drive your car onto the ferry can be long at times, but you can always park and just ride along as passengers. Our kids loved going on the higher deck and watching the large ships. 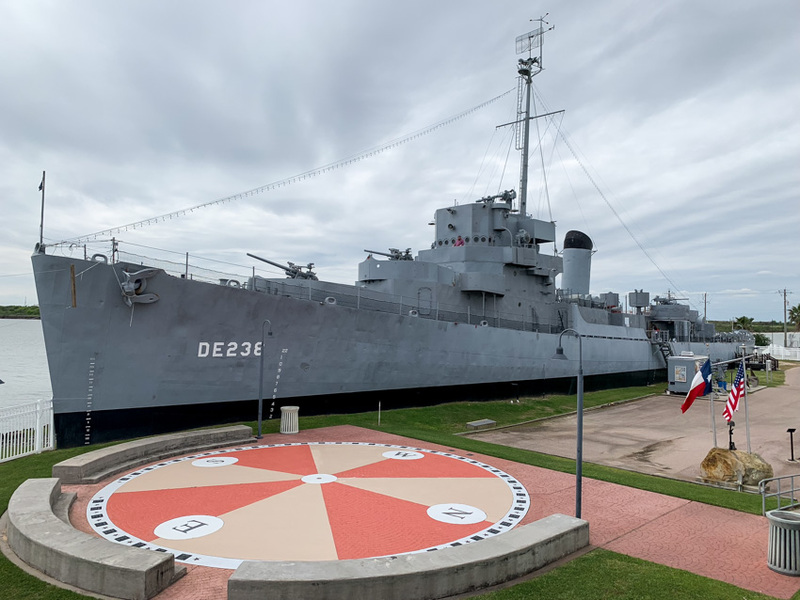 Seawolf Park is located on Galveston’s Pelican Island and is home to tourist attractions, including the WWII submarine the USS Cavalla and one of only three destroyer escorts in the world, the USS Stewart. 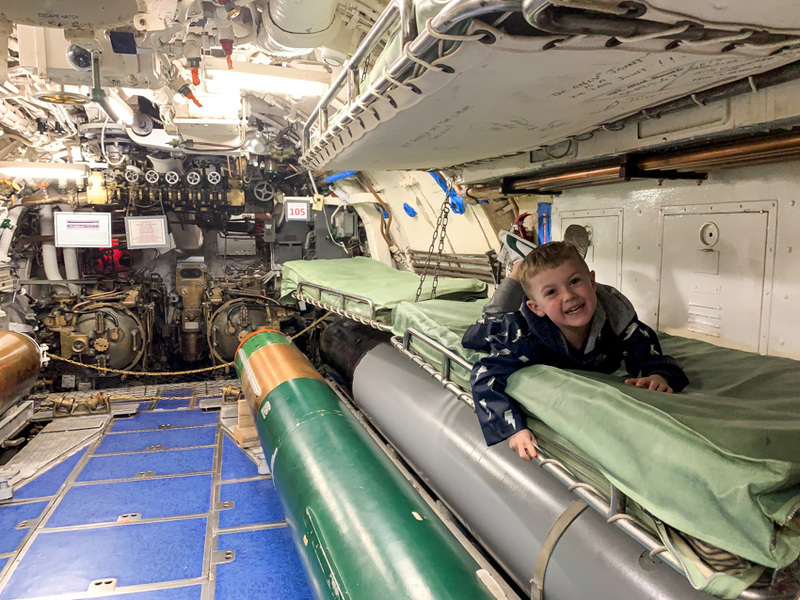 Take a walk around, on and through the submarine and destroyer for a closer look into life at sea and the history of each attraction. 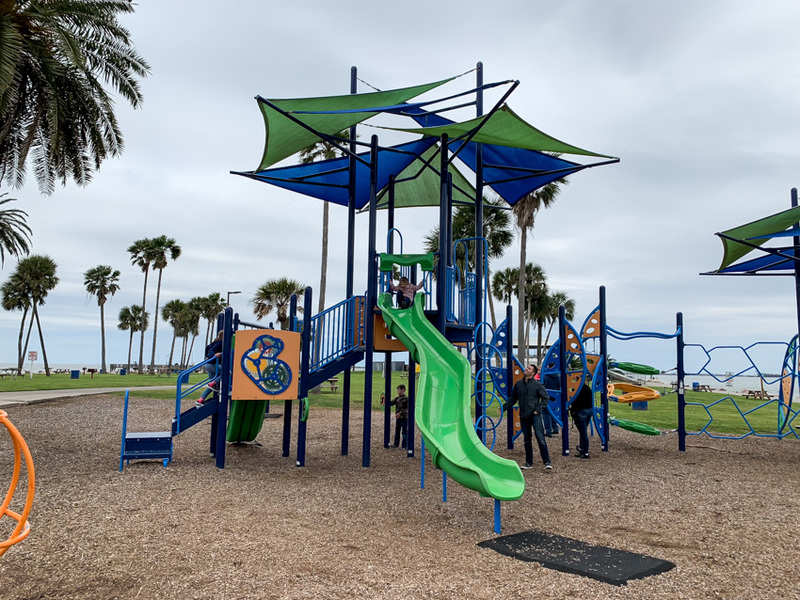 Seawolf Park is also home to the best playground on the island so if you have little ones, bring some snacks and drinks and spend some time letting them run and climb. Hop in your car, grab some road trip snacks and drive the coast! The unique thing about Galveston is that you can buy a pass to drive directly on the beach in some areas. While we kept most of our driving to the roadways, it was fun to hop onto the beach for a quick cruise. 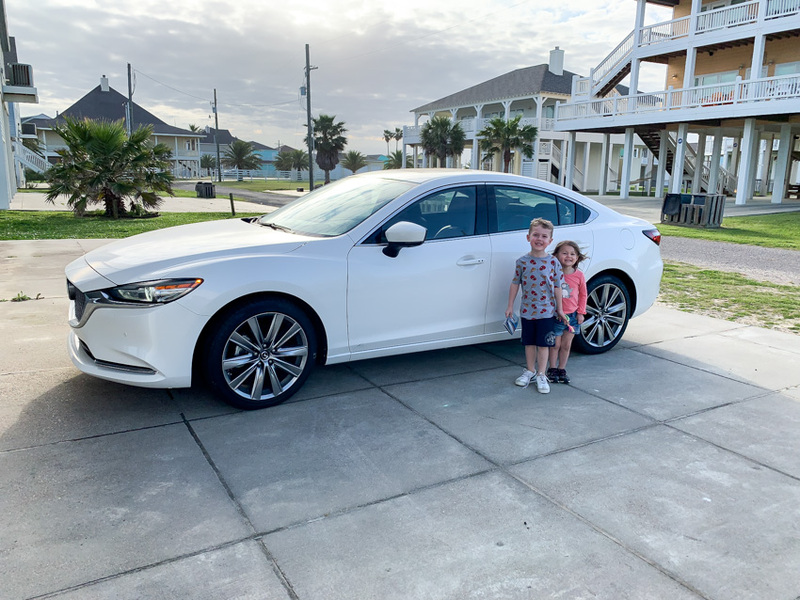 We drove a 2018 Mazda6 Signature for this trip and it was the perfect sedan for our family. The premium and lush interior was a dream to get into (hello, heated steering wheel and seats that were so welcome on a cold & rainy day) and I was totally impressed with how roomy the backseat was, especially with two large car seats. An expansive trunk held our large luggage and bags easily too (when traveling with kids I’ll take all the space I can get)! With all street side parking, the aerial view parking assist was awesome for helping get into tight spots. 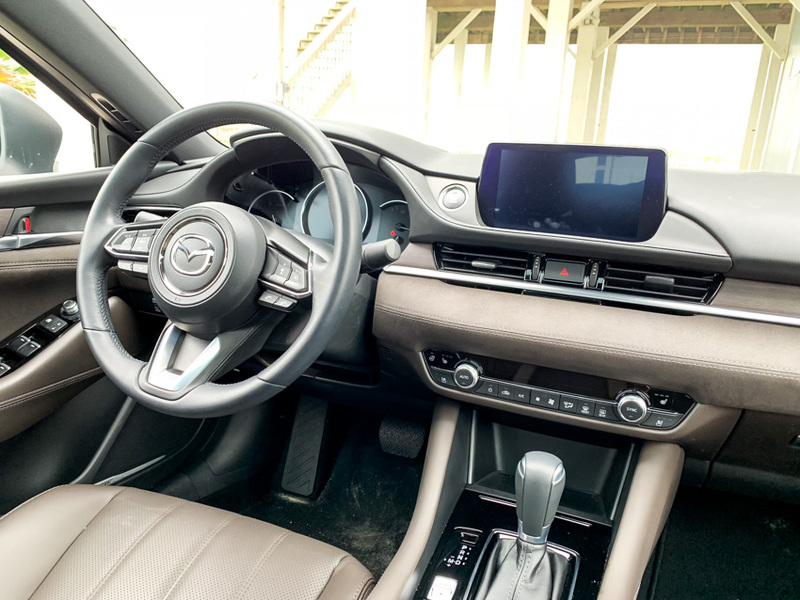 The Mazda6 Signature has amazing autonomous features. 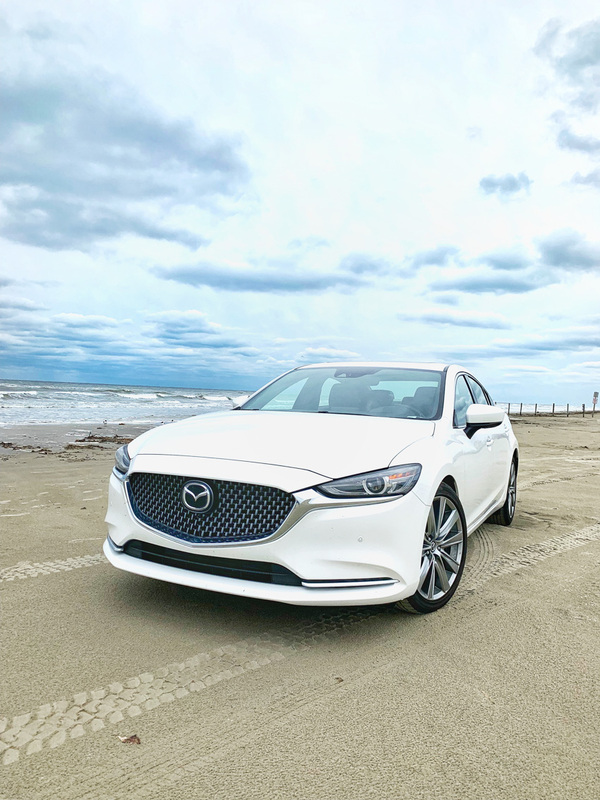 Driving on the highway, the Mazda Radar Cruise Control automatically adjusted our speed to keep a safe following distance with the car in front of me. If you desire to have more or less space, just toggle to your preference. We opted for a bit more room when in Houston with all the congestion. Once we made it out of the city, we dialed it down to keep a nice cruising pace. The Lane Keep Assist was at first startling, but surprisingly accurate and helpful. If you unintentionally depart from your lane, it vibrates the wheel and performs a minor steering correction to help guide you back to the center of the lane. Definitely some great features to keep you and your family safer while also providing a smooth and enjoyable drive. Have you been to Galveston Island? To see more video and images from our trip, check out my Instagram highlight story reel here. all of these places look like such family fun! Oh how fun! Totally adding this to my list of places to go for an adventure! This trip looks like so much fun! I would love to visit that mansion and pier. It looks like you had a wonderful time with your family. What a beautiful place! Have always been interested in this area because Texas is just one of the best states! Thanks. 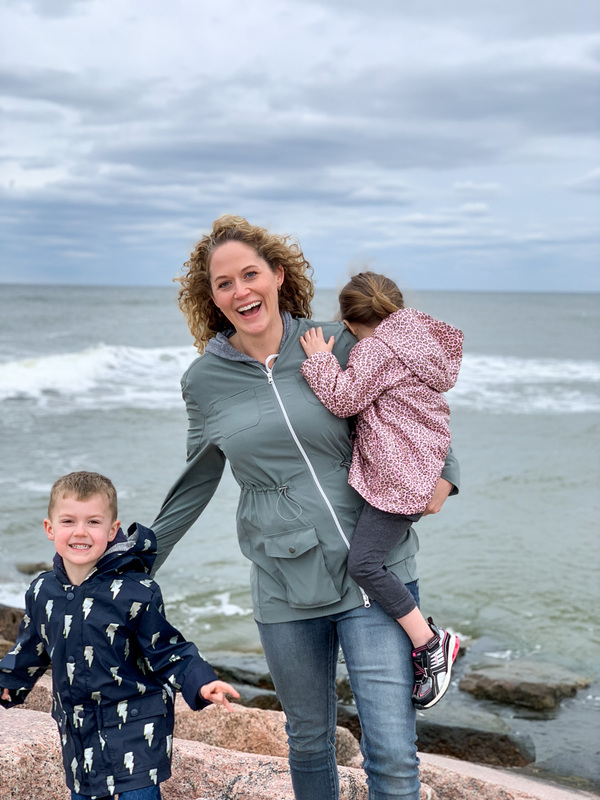 Oh…I love Galveston, but I haven’t been there since I had kids. This is definitely a helpful guide! This looks like such a great place! I’ve never vacationed in that area, but I will definitely have to add it to a place to visit!